This is my third season here in Antarctica. I fly down in late September and stay until Late February. Most of Antarctica is very cold and it never rains. However on the Antarctic Peninsula at our Palmer research station it does rain. They are a lot further north than we are here in McMurdo. Believe it or not Antarctica is classified as a desert and we receive less than 10 inches of precipitation a year. The big difference between here and Ripton is that our snow does not melt each year. Halloween is a lot of fun in Antarctica. We have a big party in our gym and everyone gets dressed up in some funny costumes. This year I made my own. I was a Dragon Slayer; my dragon had wings and fire coming out of his mouth. What is it like in Antarctica? What is it like with the lights on? Do you eat macn'cheese? Have you ever seen a seal? How do you sleep? How cold is it at night? How cold is it during the day? How cold is it in igloos? Does the igloos melt when you light a fire? Have you seen polar bears? If you can, write back to me please. I hope that in the weeks to come I will be able to answer your question of what is it like here. As this web site grows you all will be able to get a better understanding of what it is like to live and work in Antarctica. It definitely is a bit crazy having the sun up all the time. From late October till the end of February the sun never sets. It is light outside 24 hours a day. It takes a bit of adjusting to sleep in the light. Sometimes I wear an eye mask to help me sleep. Yes, we do eat Mac n cheese. Here in McMurdo we have a big kitchen and dinning room where we all eat. Ill bet we eat a lot of the same food you eat at school. I have only seen Polar Bears at the zoo. Actually there are no Polar Bears at all in Antarctica; they only live in the North Polar regions. I have seen lots of seals though. 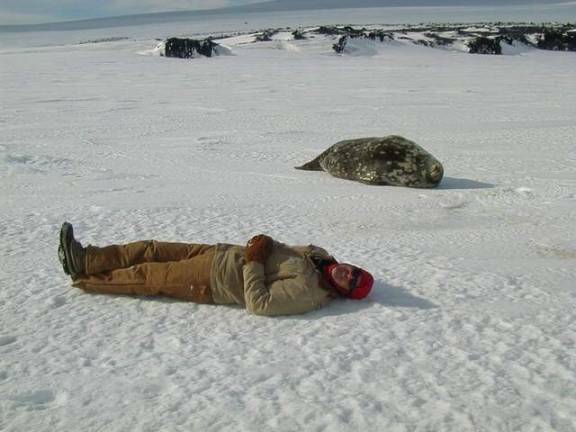 Here is a picture of me next to a Weddell Seal.